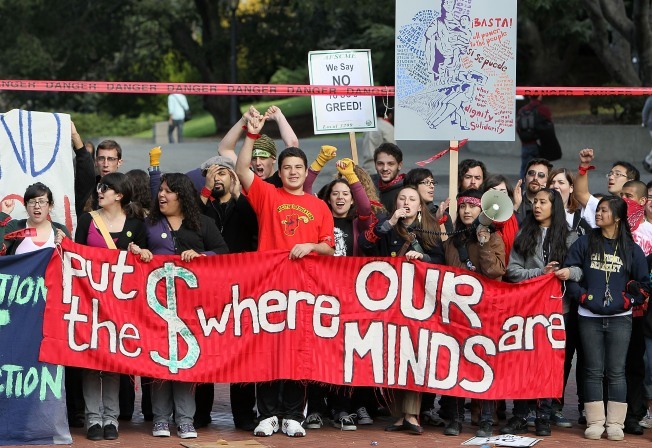 Students at UC Berkeley block Sather Gate as they demonstrate during a national day of action against funding cuts and tuition increases March 4, 2010 in Berkeley, California. They are perhaps the best-educated generation ever, but they can’t find jobs. Many face staggering college loans and have moved back in with their parents. Even worse, their difficulty in getting careers launched could set them back financially for years. The Millennials, broadly defined as those born in the 1980s and '90s, are the first generation of American workers since World War II who have cloudier prospects than the generations that preceded them. Certainly the recession has hurt young workers badly. While the overall unemployment rate was 9.5 percent in June, it was 15.3 percent for those aged 20 to 24, compared with 7.8 percent for ages 35-44, 7.5 percent for ages 45-54 and 6.9 percent for those 55 and older. Among 18-to 29-year-olds, unemployment is the highest it’s been in more than three decades, according to a recent report from Pew Research Center. The report also found that Millennials, also known as Generation Y, are less likely to be employed than Gen Xers or baby boomers were at the same age. Millennials are generally well-educated, but they have have been cast as everything from tech savants who will work cheap to entitled narcissists. The recession has pitted these younger workers against baby boomers trying to save for retirement and Gen Xers with homes and families. Eleven months was all it took to bring him from post-graduation autonomy back to his parents’ home in Apple Valley, Calif.
Armed with an undergraduate degree in literary journalism from the University of California, Irvine, and experience from an internship, the 23-year-old Barreto believed he had a better chance than many of his peers to find a job. But more than a year after graduation, Barreto is still struggling to find employment. "Right now I'm just trying to find any sort of full-time work that would allow me to live on my own and save money for the future," he said. Like many of his peers, Barreto left college with roughly $21,000 in federal loans. (The 2008 average for college students was $23,000, according to the College Board.) Barreto's parents also took out loans to help him afford college. Despite landing a job at Panera Bread Co. to support himself while looking for a job as a journalist, Barreto drained most of his savings to pay for his living expenses. He was eventually forced to move home and defer his loans. The high unemployment rate among young Millennials can affect them financially and psychologically throughout their careers, according to a report by the Joint Economic Committee. Many Millennials have sought refuge back at school from the worst job market since at least the early 1980s. Yet that strategy, too, can backfire as students incur staggering amounts of debt to pay for advanced degrees that might not help them out much in the job market. Hueseman said that after one job application, he was told he should leave his degrees off his resume. Hueseman said he was tempted to follow the advice but couldn’t bring himself to do it. Even if they did feel inclined to do it, they'd be competing for that job with their peers and with plenty of older jobless workers. About 15 million Americans currently are out of work, 45 percent of them for at least six months. Competing against older workers with years of experience has put many Millennials on the losing end of job interviews. And while that's typical of past recessions, the long-term unemployment characteristic of this cycle is forcing many older workers to seek jobs that would have gone to younger workers in the past. “The average length of unemployment now is almost like six months, which is an all-time high, so the longer people are unemployed and the longer they go without being able to find a job, the more willing they are to accept a job that’s lower paying or for which they’re overqualified,” said economist Marisa Di Natale of Moody’s Economy.com. Baby boomers also are delaying their retirement, adding to the competition. A quarter of workers postponed their retirement in the past year, with 33 percent of workers now expecting to retire after 65, according to a retirement survey by The Employment Benefit Research Institute. If they do manage to get hired, younger employees are often the first to be fired in layoffs. And when Millennials do land a job, it probably won’t be as lucrative due to intense competition for jobs. That means that this generation’s potential earning power is likely to lag over the course of their careers. Young workers who start off in a recession generally begin in lower-ranking positions and have difficulty shifting into better jobs the first 15 years of their careers, according to a study that looked at the experience of workers who launched their careers in the early 1980s. Young workers on average lost over $100,000 in earnings over the course of their careers due to the recession, concluded the study by Lisa B. Kahn of Yale University. When asked if Millennials will face similar income losses, Kahn said it’s somewhat difficult to predict but likely. “There are a lot of similarities with this recession to the recession of the 1980s in that it was the biggest we’d seen since the Great Depression. It’s affecting educated workers, so my guess would be unfortunately, yes,” Kahn said.